Learn how you can automatically log in to multiple Gmail accounts and check all your mailboxes simultaneously. If you have multiple email accounts on Gmail – say one for your personal emails and other for your business – you don’t have to log out of one email account to check the other mailbox. Google, as most would probably know, allows multiple sign-in so you can easily log in to two or more Gmail accounts simultaneously inside the same browser. And this works with Google Apps accounts as well. There’re however some limitations here. One, if you sign-out of one Google Account, you will automatically get logged out from all your other Gmail / Google Accounts as well. Second, if you are launching a new browser session, you’ll have to log in to all your Gmail accounts separately because you can switch from one account to another. Let’s say you have three Gmail accounts – one is your primary account that you need to check throughout the day while the other two email accounts aren’t that important. Wouldn’t it be nice if you could just log into your main Gmail account and automatically get signed into all your other Gmail accounts as well but without having to type the login credentials of any of those accounts? The trick is really simple. Gmail offers a useful feature called Email Delegation where you can share your inbox with other people (say your spouse) but without revealing your password. Once you delegate your Gmail account to someone, they get instant read-write access to your mailbox and they get signed in to your Gmail account as soon as they sign in to their own Google account. Sign-in to one of your secondary Gmail accounts and go to Mail Settings –> Accounts –> Grant Access to your account (screenshot). Choose “Add another Account” and specify your primary Gmail email address here. You’ll now get a confirmation email (screenshot) in your primary mailbox. 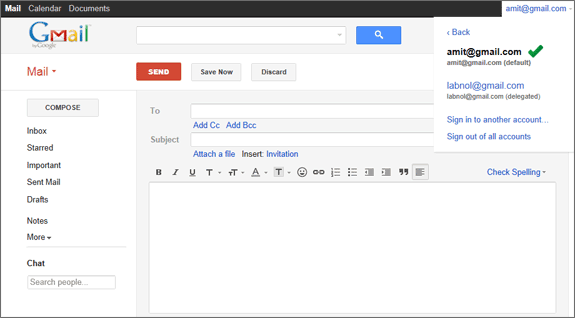 Accept the request and repeat these steps for all your other Gmail accounts. That’s it. Once you sign-in to your main Gmail account, you also check all your secondary email accounts by choosing the “Switch Account” option in the upper left corner of your Gmail window. There’s absolutely no need to manually sign in to any of the other email accounts. Should you use email delegation instead of multiple sign-in? It depends. This delegation option is only limited to Gmail so while you can check your email account from another Google account, you would still need to sign-in to access your Google Docs, Calendar, Google Plus and other Google products. Second, while multiple sign-ins allow you to check a Gmail account from a Google Apps account, delegation would only let you share your mailbox with accounts withing the same organization (i.e. email with the same domain name). One more thing. If your main Gmail account gets hacked, the person will instantly have access to all your other mailboxes as well.